The Central Core Region of the Berwyn Mountains: Thick Marine Mudstones of the Llangynog Formation. Photo 7, (above). Llangynog Formation mudstones exposed in the central Berwyn Mountains, near Cefn-y-Rhodfa, in the Afon Iwrch valley, north of Llanrhaedr- ym-Mochnant. 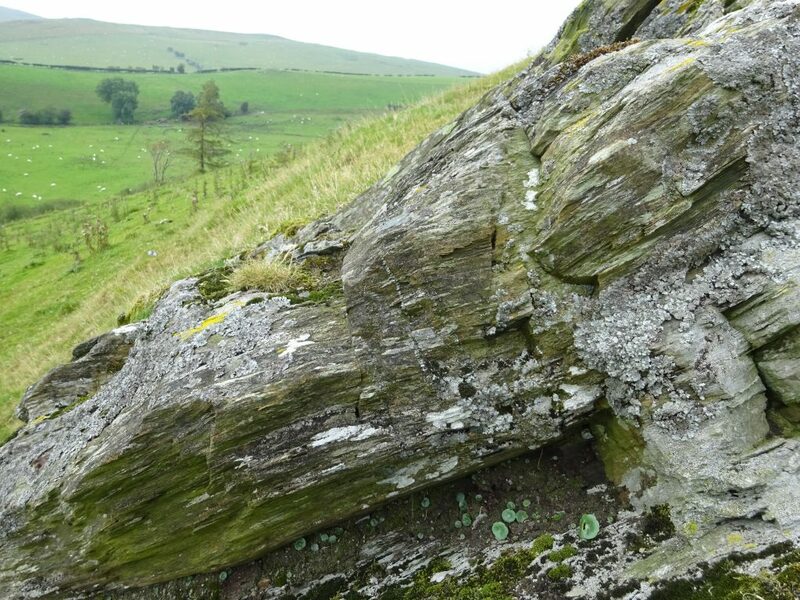 These thick mudstones (over 1000m thick) outcrop over most of the central Berwyn Mountains, and form the majority of the core region of the Berwyn Dome structural uplift. 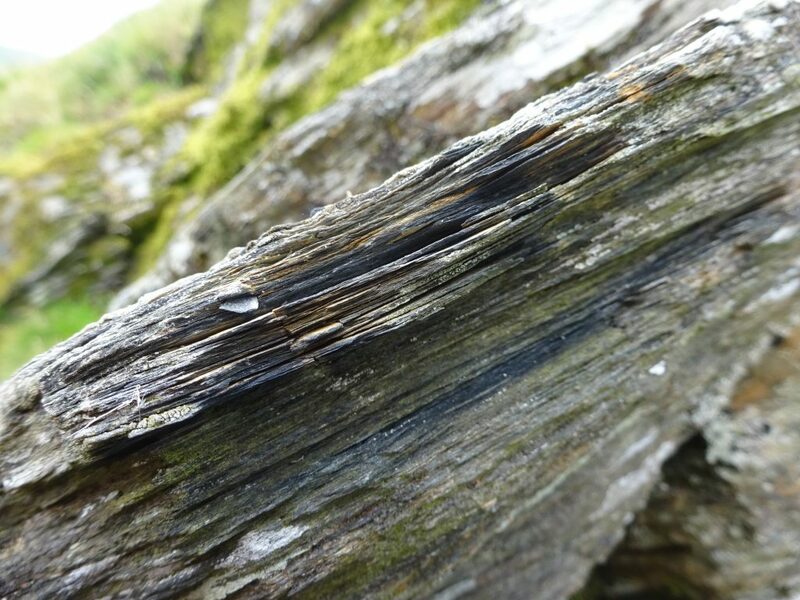 Stratigraphically they lie above, and are younger than, the limestones we saw earlier at Pen-y-Graig. A low energy environment of deposition (possibly marine, sub-tidal to shelfal conditions) is suggested by their thinly laminated structure, consisting of many layers of fine grained mud (Photo 8, lower left). However, sub-vertical, quartz filled fractures, seen in Photo 9, below and common, mainly west-east oriented subsidiary fold structures within the Berwyn Dome also suggest later tectonic deformation, probably caused by south-east to north-west oriented compression and uplift of the Berwyn Dome structure in the Early to Mid-Devonian Acadian Orogeny. 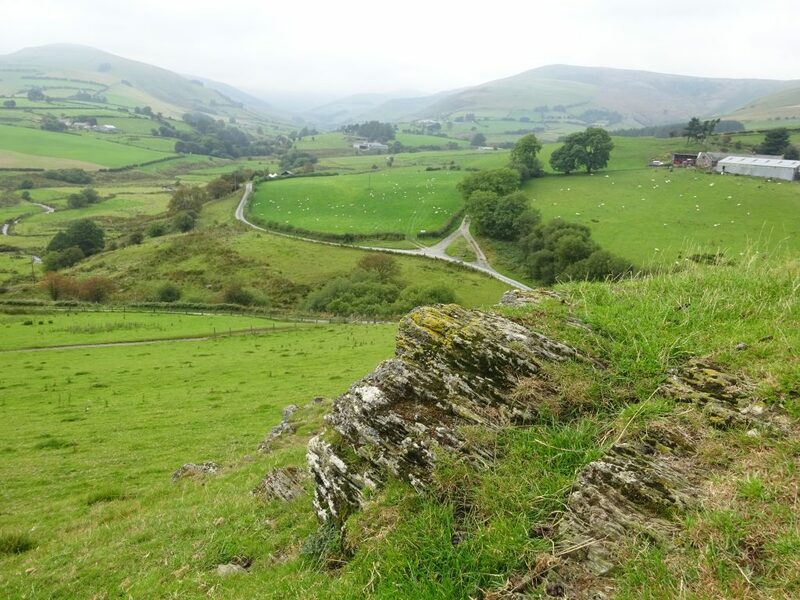 The Llangynog Formation also contains several other very different rock types, as we shall see over the next few pages, some of which have a significant influence on the local topography and scenery.